LONG BEACH — France’s Olivier Backes and crew Matthieu Vandame figured they needed to sail only two of the last three races to take first place in the Globaltech Formula 18 World Championship Sept. 15. Wrong. They needed only one, as a light southwest breeze gasped its last against warm desert Santa Ana winds — a local autumn phenomenon — blowing offshore from the opposite direction. It left the fleet of 118 Gold and Silver flight boats from 16 countries drifting helplessly during the event, hosted by Alamitos Bay Yacht Club. The regatta was caught in the middle. The single race was delayed 1.25 hours by racers’ early starts and course changes required with shifting light winds of 3 to 7 knots. Later, as the stragglers crept in from the mile-square trapezoid course, principal race officer Mark Townsend debated for an hour whether to continue. At one point, he even studied smoke from an oil refinery fire west of Long Beach for clues to what the wind might do. Then at 3:30 p.m., he called it a regatta — and Backes and Vandame’s coach, Alex Udin, jumped aboard their cat to provide the winners a champagne shower. “When I put up the (abandonment) flags, all the boats cheered,” Townsend said later. As far as the championship was concerned, ending two short of the 15 scheduled races made no difference. Backes/Vandame finished 15th in Saturday’s only race, but none of their challengers finished better than sixth — not nearly enough to threaten their lead, especially with a second throwout to play. Even with the subdued climax, Olivier said the victory was better than his first win of the F18 Worlds two years ago in France. Olivier had another crew in 2010, so this was Vandame’s first F18 Worlds title. “I’m really happy,” he said. So was Karel Begemann, crew for Oscar Zeekant on the runner-up boat from the Netherlands. In fact, Dutch boats seized four of the top six places overall. It was the first F18 Worlds in the U.S. 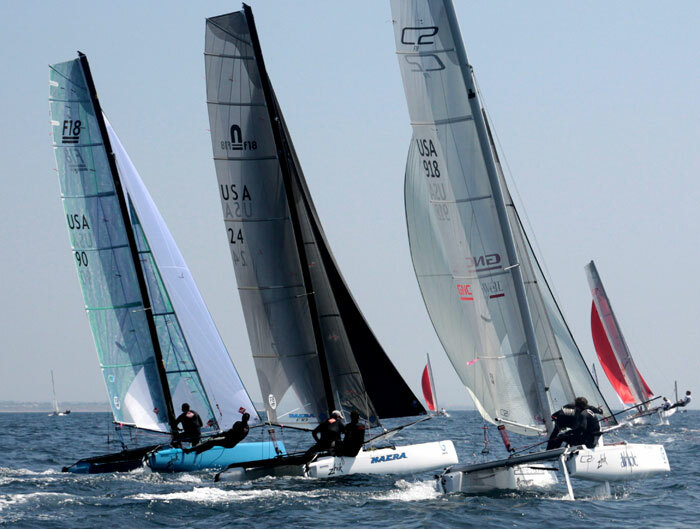 The top American boat finished 10th, sailed by Michael Easton and Tripp Burd of the New England Nacra Sailing Association (NENSA). Gold Flight: 1st: Olivier Backes (helm) and Matthieu Vandame (crew), SN Marseille, France; 2nd: Billy Beeson and Jeremie Laguarrigue, SRV, Switzerland; 3rd: Mischa Heemskerk and Bastiaan Tentij, WSV Braasemermeer, Netherlands; 4th: Darren Bundock and Jeroen van Leeuwen, Toukley Sailing Club, Australia; 5th: Oscar Zeekant and Karel Begemann, WSV Warder, Netherlands. Silver Flight: 1st: John Hoag and Todd Christensen, Corinthian YC (Seattle), U.S.A; 2nd: Guy Selsmeyer and JJ Johnson, Catamaran Racing Association of Wisconsin, U.S.A; 3rd: Jeff Ledee and Vincent Jordi, CNSB, France; 4th: Ken Marshack and Eric Marshack, Vancouver Lake Sailing Club, U.S.A; 5th: Christian Vilate and Juan Cruz Benitez, El Aguila, Argentina.